The Unité d'Habitation is the name of a modernist residential housing design principle developed by Le Corbusier, with the collaboration of painter-architect Nadir Afonso. The concept formed the basis of several housing developments designed by him throughout Europe with this name. The first and most famous of these buildings, also known as Cité Radieuse (radiant city) and, informally, as La Maison du Fada (French - Provençal, "The House of the Mad"), is located in Marseille, France, built between 1947 and 1952. 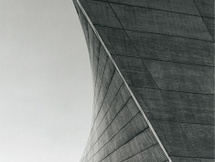 One of Le Corbusier's most famous works, it proved enormously influential and is often cited as the initial inspiration of the Brutalist architectural style and philosophy. The Marseille building, developed with Corbusier's designers Shadrach Woods and George Candilis, comprises 337 apartments arranged over twelve stories, all suspended on large pilotis. The building also incorporates shops with an architectural bookshop, sporting, medical and educational facilities, a hotel which is open to the public, and a gastronomic restaurant, Le Ventre de l'Architecte ("The Architect's Belly"). The flat roof is designed as a communal terrace with sculptural ventilation stacks, a running track, and a shallow paddling pool for children. The roof, where a number of theatrical performances have taken place, underwent renovation in 2010. It has unobstructed views of the Mediterranean and Marseille. Inside, corridors run through the center of the long axis of every third floor of the building, with each apartment lying on two levels, and stretching from one side of the building to the other, with a balcony. Unlike many of the inferior system-built blocks it inspired, which lack the original's generous proportions, communal facilities, and parkland setting, the Unité is popular with its residents and is now mainly occupied by upper-middle-class professionals. The building is constructed in béton brut (rough-cast concrete), as the hoped-for steel frame proved too expensive in light of post-War shortages. The Unité in Marseille is pending designation as a World Heritage site by UNESCO. It is designated a historic monument by the French Ministry of Culture. 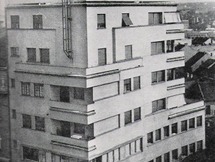 In the block's planning, the architect drew on his study of the Soviet Communal housing project, the Narkomfin Building. Le Corbusier's utopian city living design was repeated in four more buildings with this name and a very similar design. The other Unités were built and are: Unité d'Habitation, Nantes-Rezé of 1955, Unité d'Habitation, Berlin-Westend (1957), Unité d'Habitation, Briey-en-Forêt (1961), and Unité d'Habitation, Firminy-Vert (1967). The replacement material (béton brut) influenced the Brutalist movement, and the building inspired several housing complexes including the Alton West estate in Roehampton, London, and Park Hill in Sheffield. These buildings have attracted a great deal of criticism. Other, more successful, manifestations of the Unité include Chamberlin, Powell and Bon's Barbican estate (completed 1982), Gordon Tait's Samuda Estate, Isle of Dogs (1965) and Ernő Goldfinger's Balfron Tower (1967) and Trellick Tower (1972), all in London. The Reserve Square Complex in Cleveland, Ohio which was built 1969-1973 was also influenced by Le Corbusier's project.